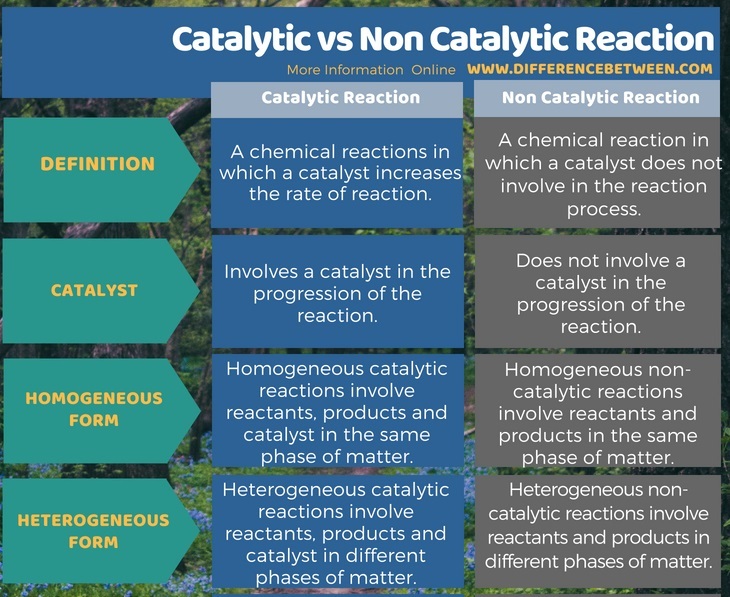 The key difference between catalytic and non catalytic reaction is that the catalytic reaction involves a catalyst in the progression of chemical reaction whereas the non catalytic reaction does not involve a catalyst in the reaction. Chemical reactions are the conversions of reactants into products by chemical means. Some chemical reactions are spontaneous at normal conditions while others are non-spontaneous. Some chemical reactions involve a catalyst in order to increase the reaction rate. 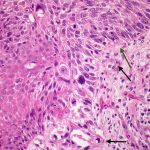 These catalysts can be either biological components or chemical components. Catalytic reactions are chemical reactions in which a catalyst increases the rate of reaction. The catalyst can be either a biological compound or a chemical compound. These compounds increase the reaction rate by reducing the activation energy of the reaction. The catalyst is never consumed during the chemical reaction. Therefore, we can regenerate the catalyst. Usually in these reactions, an intermediate complex forms in between reactant stage and product formation stage. This intermediate is a temporary complex. This intermediate formation leads to the regeneration of the catalyst. Catalysts can be either homogeneous or heterogeneous catalyst. Homogeneous catalysts are in the same phase as the reactants while heterogeneous catalysts are in a different phase other than the reactants. 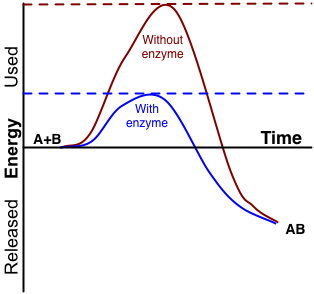 Enzymes are biological catalysts. What is Non Catalytic Reaction? Non catalytic reactions are chemical reactions in which a catalyst does not involve in the reaction process. Therefore, in these reactions, the reaction rate does not increase by any external influence. There are two types of non catalytic reactions; they are homogeneous reactions and heterogeneous reactions. In homogeneous non-catalytic reactions, the reactants and products are in the same phase whereas, in heterogeneous non-catalytic reactions, the reactants and products are in different phases. What is the Difference Between Catalytic and Non Catalytic Reaction? Catalytic reactions are chemical reactions in which a catalyst increases the rate of reaction. That is, these reactions involve a catalyst. But, the non-catalytic reactions are chemical reactions in which a catalyst does not involve in the reaction process. This is the main difference between catalytic and non catalytic reaction. Furthermore, both these reactions have two forms as homogenous and heterogeneous. Homogeneous catalytic reaction involves reactants, products and catalyst in the same phase of matter. Heterogeneous catalytic reaction involves reactants, products and catalyst in different phases of matter. Similarly, homogeneous non-catalytic reaction involves reactants and products in the same phase of matter and heterogeneous non-catalytic reaction involves reactants and products in different phases of matter. Chemical reactions are in two types as catalytic form and non-catalytic reaction. The difference between catalytic and non catalytic reaction is that the catalytic reaction involves a catalyst in the progression of chemical reaction whereas the non-catalytic reaction does not involve a catalyst in the reaction.